I speak at a lot of coaching clinics this time of year, which lets me listen to and learn from the best in the game. 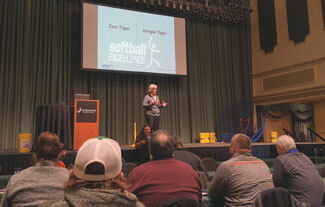 Discover 4 things I learned from the NFCA Coaching Clinic. When I speak with coaches like Patty Gasso, Beth Torina, Rachel Lawson and Kelly Inouye- Perez I’m taking as many notes as I can, so read 4 things I learned from them. You can always learn something, if you’re paying attention. To me, learning is the coolest thing! I LOVE learning new ways of looking at something I’ve looked at forever. And that’s what happens when I go speak at a coaching clinic – I learn a new way to look at something I’ve been doing forever. Recently I spoke at the NFCA’s Coaching Clinic in Louisville, KY along with 4 of the best coaches in college softball: Patty Gasso from the University of Oklahoma, Kelly Inouye-Perez from UCLA, Beth Torina from LSU and Rachel Lawson from the University of Kentucky. While I took 16 pages of notes, I’m sharing 4 of the things that stood out to me. Keep in mind that these are all very successful, major college coaches, and yet the things I list are all very basic. The best do the simple things well! Changeups are about Maturity – (Beth Torina, LSU) Nobody want to throw slow, so it takes a mature pitcher to know that throwing slow (her changeup) makes her better! Spray Chart – whose doing it this game? Pitching Chart – whose doing it this game? QAB (Quality At-Bat Chart – whose doing it this game? Warming Up Outfielder – who needs to grab their glove and a ball and hustle out in between innings and throw with the side outfielder? Warm Up Pitcher/Game – whose responsible for having their mask and glove ready to hustle out and help warmup the game pitcher if the catcher is delayed going out? Warm Up Pitcher/Bullpen – Whose responsible for having their glove and mask ready to go down to the bullpen and warm up the pitcher? Creates Groups within the Group – (Rachel Lawson, Kentucky) She creates 4 groups of 5 players within her team. She makes sure all the freshmen are split up into each group. These groups help players learn about each other & create closer bonds. They keep the same groups all year, and use them anytime they need to do things in groups, for competition, weight room or conditioning. Saves time and creates bonds. A Great Bunt gets all Infielders Converging – (Patty Gasso, Oklahoma) says a great bunt is when you get both corners, plus the P and C converging on the ball. It creates confusion about whose covering 3rd… so defensively, you’ve got to practice that situation. So, ball your infielders up, put a runner halfway to 2nd, then toss out a ball and practice who fields the ball and who breaks out to cover 3rd. Practice it or you won’t play it!